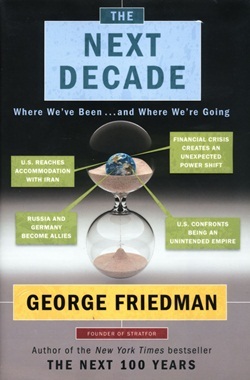 It would seem that everyone is interested in the future, and Author George Friedman has already written “The Next 100 Years” but none of us reading this review will still be around next century. However, almost all the readers would hope to be around for the next decade. 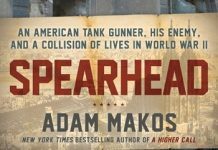 The book deals with the post 9-11 terrorism and the 2008 financial crash. Friedman points out that the sub-prime mortgage debacle was not just an “American” bubble that burst, but one that encompassed Eastern Europe as well. Banks were offering low rate loans, but these were quoted in euros, Swiss francs and even yen. With falling exchange rates for his zlotys, the middle European home buyer faced higher and finally impossible repayments. Gambling on the global currency markets would be a disaster. And it was. The book looks at the inter-country relationships and their direction in the next decade. The Israel – American situation is examined, after an explanation of the Jews-Syrian Arabs situations. Friedman points out that after the collapse of the Ottoman Empire and the later French and British meddling with borders, there were very few national allegiances. Friedman proposes that in the next 10 years America will have to retreat somewhat in its relationship with Israel and move closer to the Arab states. With the current Middle East problems, one is left wondering if this is already happening before our eyes. We may not have to wait for the decade. Cogent argument is given as to why the US has to leave the Iranian nuclear facilities free from attack to preserve the balance with Turkey, a nation which has a clearer 10 year future. Now add in Russia, SE Asia, Africa, e-commerce, technology and more. At B. 830 for a hardback edition, this is a fascinating book, particularly as it has many very salient points and the research leading up to today is quite compelling. Next articleNow available: Two e-books by Pattaya Mail’s Cartoonist M.J.B.